I hoped to finish Noah’s book before his birthday today, but I didn’t quite make it. I’m still editing the last half, adding resources to the appendix, and waiting for my husband to design the cover for me. Hopefully I will publish it by the end of the year! 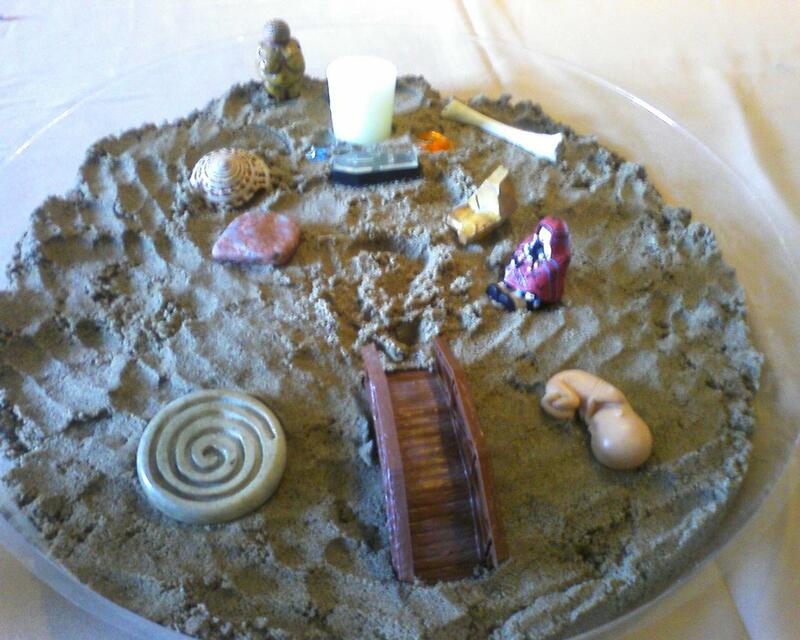 Instead, I wanted to share some pictures and thoughts from a sand tray therapy exercise that I did during a session at the ICAN conference in St. Louis in April. I’ve been meaning to post about it since then and haven’t found the opportunity, so in honor of his birthday seems very fitting and appropriate. The session was intentionally kept small for personal sharing and when we walked in the therapist, Maria Carella, asked if we were there to celebrate a birth or to grieve one. I said I was there for both (I had Alaina with me and she slept in the Ergo during the session). Each of us had a tray of sand and there were long tables at the front of the room full of objects and materials (like shells, feathers, and so forth). 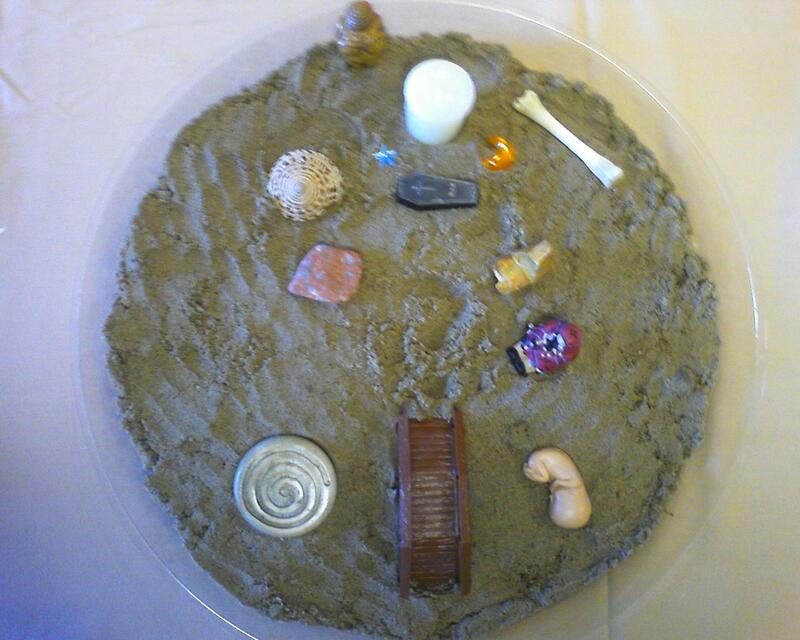 We were paired up and after arranging our items on our sand, we were asked to share our tray with the person next to us as well as the message, lesson, reflection, or insight we received from the process of making the tray. While some people used the sand in various creative ways—mounding it up, etc.—I just smoothed mine out and put stuff on top of it. The experience of sharing with my tablemate was very moving and profound. We had a lot of surprising similarities in our feelings about our births, though our stories were very different. And, our closing thoughts or insights about our trays were almost identical. While it might be hard to see everything, I chose the bridge to symbolize my feeling of having crossed the bridge to the “other side”—meaning first the fact that after Noah and my second miscarriage, I felt separated from women who had not experienced loss by a bridge and as if I’d crossed over into new territory and left my old, happy, naive pregnant self behind (along with the other non-loss mamas. A little more about this bridge here). AND, that I also felt like with Alaina’s birth that I crossed a bridge into the unknown and to the end of the pregnancy-after-loss journey. Her birth represented the “other side” of PAL. So, at the end of the bridge I drew a question mark in the sand, representing all the questions I had to get past and over in order to get to my new baby. The little baby on the side of the bridge represents how I still had Noah with me. He didn’t get “left behind” on the other side of the bridge, but was next to me on my journey. The spiral on the other side represents the continuous, unfolding spiral of life. Sitting by the question mark is a sort of Kachina-type figure holding many babies. To me she represents all of the babyloss mamas and also reminds me of the jizos who protect lost babies. There is also a coffin on the other side of the question mark, summing up how the fear of the death was everpresent for me and I had to pass over that fear as well to get to my new baby—my light, the candle on the other side of death. The little sparkling gems also represent my joy at her birth and what a treasure she is to me. The bone on the side of the candle represents the places where the “meat was chewed off my bones” by all my births, including Noah’s (I had just attended Pam England’s birth story sharing session prior to this sand tray session). I placed the Goddess of Willendorf figure, that I had immediately snatched off the table as soon as I spotted her, at the top to represent how my sense of spirituality had surrounded and enfolded both my experiences—She is “holding” it all. And, I explained to my tablemate how the roundness of the tray to me also represented the full circle—how Alaina’s story and Noah’s are entwined and how her birth was the “end” (of sorts) of his story, but that they are part of one whole. Happy birthday, tiny third son. We remember you. Thank you for opening my heart and my life for your sister to enter. *tears* What a beautiful and profound way to celebrate a tiny being who touched us all in so many ways. So very beautiful. Thank you for sharing this with me.